For a little while I’ve realised that sharing good times with others is what makes me enjoy those moments the most. Admiring the coastline from a SUP board with the water totally calm, feeling that you are standing over a huge liquid mass that is breathing in rhythm under your feet but you are feeling comfortable; that‘s something we have all experienced. But I am sure that you have also wanted to share those kind of moments with friends or family. I have the chance to enjoy these things with my brothers and my boyfriend and I’m grateful for that, but I still want to share them with more people I love. I wish I could offer them those moments as a present. Someone who I really wanted to do so with, and on the coast where I live, is my friend Sarah Hebert. 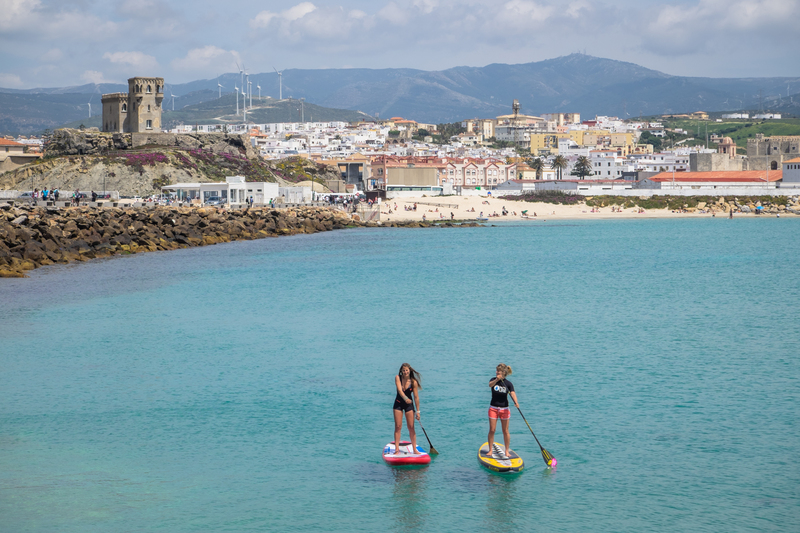 Spain’s Cadiz coast is such a natural playground for exploring on a SUP. You can cruise along rivers that run through quaint fishing villages, head into the forest or just pass by flowery fields with cows grazing. You can surf by yourself at little beaches with wonderfully clear water, perfect peeling waves breaking on outer reefs in front of the red cliffs, watching the sunset over the horizon through the waves. Observing such a stunning scene, your mind wonders whether it is real or not. That’s when you realise how beautiful life is – and how SUP is changing your relationship with nature forever, letting you experience it from a deeper level. Of course you can get these kind of moments in many places around the world, but in Cadiz we have so many of these spots; places that make you feel small on a big and beautiful planet. Depending upon which season you visit, you will find very different landscapes – but always hypnotic ones. In spring you can paddle along beaches or pass through green fields full of flowers; huge sunflower plantations and a bright blue sky. In summertime the countryside is dry and yellow, reminiscent of Van Gogh paintings. Even in summer you can find quiet places to paddle and if you like to wander around in the villages in search of dinner, tapas or a lively bar then summer is the season to come. Sarah and I were interested in finding beautiful, quiet places to surf and cruise in harmony with nature. We found some truly magical places, full of energy and amazing beauty. With so many options, it was hard to choose our spots. The channels on the marshes offer unique paths, with seabirds all around you. At some points in the year you can even find numerous flamingos, a wonderful sight. Paddling during the sunset or under a full moon is a unique experience. Los Toruños, on Cadiz Bay, is ideal for this kind of route – and then you can keep on paddling to the nearby fishing villages. In the natural park of Doñana you’ll discover amazing channels and a very special atmosphere too. We decided to explore Sancti-Petri. The little village and the island of Sancti-Petri with its castle are magic spots, there is no doubt! The place has lived through some interesting history. During XII BC a Hercules temple was built on the island. Some historians say that Hercules himself was buried under the temple, and many sailors since have offered their sacrifices here over the years. It is even said that Julius Caesar visited the temple to be blessed before a mission. Nowadays you can still feel that history and energy. And, as with every special place, there are some legends in the air… some say that the Atlantis was submerged right there. Today the village is very peculiar, with ruins from an old fishermen’s village, some chiringuitos to eat fresh fish right in front of the river, a windsurfing club (my club! ), a little port and beautiful paintings of whales on the ruins‘ walls. Cruising down channels past small fishing boats and the sand islands that emerge at low tide is marvelous. Early in the morning it is quiet and peaceful. Sarah and I paddled in crystal clear, flat water under the warm sunrise light, watching the seagulls standing on the sand islands in front of the castle. We paddled in silence towards the birds until they noticed our presence. They started flying all around us while we were just floating in harmony. Simply beautiful. Next we headed along the coast, to the north and then to the south. Heading north you can go to Cadiz town – just point to the huge new bridge marking the north. It‘s not that far and the coastline is wild and sandy with picturesque sand dunes. Sometimes you’ll get lucky and can even surf on the way. Going south, follow the red cliffs of La Barrosa beach and just paddle and paddle as long as you want, passing in front of Roche or Conil; both of them beautiful, sometimes boasting amazing waves and not many people. We explored Conil and went up the river but soon realised this was not the best idea – too muddy and a treatment water plant…! So, even though the landscape around the river is stunning, in Conil we suggest that you just cruise along the coast in front of the cliffs. Going further south you find the famous wave spots of El Palmar and Caños de Meca (Cabo de Trafalgar). Both of them are powerful because of their history, location and landscape; again some of those magic places on the map that you should visit. Then, from Barbate to Tarifa (the most southerly point), the coast is quite wild and beautiful, passing through Zahara and Bolonia – two very charming villages. Long sandy beaches alternate with hidden little coves, natural pools, cliffs and sand dunes overtaking pine woods. All of this is a great area to cruise on calm and clear waters, and it is also perfect for downwinders when the Levante or Poniente winds blow. Bolonia is probably the most special of our beaches. You can find cows walking along the long and white sand beach which ends with a huge dune that climbs over the mountain, over the pines and over anything else in its path, right on the side of the Roman ruins of Baeloclaudia. Here in summer you can enjoy live music or a play at the old theatre, watching the moon reflected on the sea right behind the stage. This is absolutely amazing, a unique experience that you will never forget. Once in Tarifa, the coast line is very similar to Bolonia with the sand dune on the north, a result of the Levante winds, a long beach to the south and the Atlas mountines from Africa right in front of you. At certain times of the year you can find nice lagoons along the beach, and you can also explore Jara river. Of course there’s the opportunity for downwinders here but also Tarifa island is a spectacular place to cruise around. Don’t miss the opportunity to take snorkelling gear and discover what lies within the deserted little coves. The island is linked to mainland by a small road, which is the exact dividing line between the Atlantic ocean and the Mediterranean sea. Another magic place. It is very important to be informed about currents and tides, as well as the wind forecast. This coast can be surprisingly powerful and dangerous. We have some picturesque swamps and lakes to visit too. Around Arcos de la Frontera, Castellar or Benalup you can cruise on the foggy waters during the mornings, a very mysterious atmosphere. There are spots too where you can camp, so it’s worth taking your time, walking and paddling, to discover the local fauna – as well as trying the superb tapas from the ‘ventas‘. Sarah is lucky, she stayed for just ten days and yet we managed do everything; windsurfing and SUP, on the flat and in the surf. The wave of El Lentisco, in La Barrosa, only works every three years in front of my house. Well, today it’s perfect! I can’t believe what I‘m seeing. We stay in the water until nightfall, facing the red cliffs of the coast. We were looking for accessible peaks, where it’s easy to SUP surf and without too many people. We discovered that while there are plenty of places like this, it heavily depends on the weather and what time you go. El Palmar is always the busiest area. But simply walk a little to the right or the left of Mogollon and it’s quiet – and the same happens in Cortadura and at the other beaches too. Our favorite spot of all is at the north of La Barrosa beach in Chiclana. One day we tried to surf at Cape Trafalgar and Caños de Meca. There are several sites for SUP surfing, all as good as each other. But today, after a rather flat winter, all the local surfers seem to have agreed to surf here. It’s too busy for us to paddle. I regret not being able to share this idyllic place that I have talked so much about with Sarah, with its long, perfectly lined up waves overlooked by the lighthouse. We continue to El Palmar but it doesn’t look good. A little disappointed, we head home. There we get a rather lovely surprise – we see some peaks, at this spot that breaks so rarely right in front of our house in La Barrosa. Today those peaks are flawless. Here the sunsets are sublime; I know that tonight will be memorable. Wave after wave, rights and lefts, we surf until night. There are three more friends with their SUP boards in the water. Nobody else. Lentisco’s waves gave us a great session. From north to south, you can enjoy plenty of other spots on this coast including Cien Metros, Las Redes, Cortadura, Roche, La Fontanilla, Yerbabuena, Bolonia, Benavides and Balneario. On this coast, life is good. The cities are very welcoming. We laugh, we dance and we certainly eat well in Andalusia – thanks to its proximity to the sea, its fruit plantations and its famous olive oil. Sarah feasts on octopus a la plancha accompanied by saffron potatoes. She made a great choice; that’s definitely my favourite tapas! The people of the coast of Cadiz are bright, happy and have a special energy. There is always something to do. People in the streets and on the terraces, local festivals plus beautiful flowers and winding, quaint alleys give a special charm to the villages. After lunch the whole town is quiet. We’re on Spanish time and it‘s nap time. Whether you slept or not, the shops are closed and if it is hot then people flee the streets and rest. Later the activity resumes. I enjoyed watching Sarah absorb all of this as well as sampling plenty of traditional tapas. Castellar, Tarifa, Conil, Zahara… all these coastal cities are beautiful but Vejer, for me, is the one that has everything. It is perched on top of a hill with white houses all crammed in haphazardly, some suspended in the abyss of the cliff. Vejer is a village reminiscent of northern Morocco but with geraniums in the windows. It has a pleasant cosmopolitan and bohemian atmosphere. Its curved streets are organised in a huge and happy mess, encouraging you to walk around and breathe in the breeze that rises slowly around the little streets, enjoying every step. Nearby airports: Jerez, Malaga and Seville. Camping: At almost every beach there is a campsites. It’s also possible to free camp in some areas. Getting around: To enjoy the area and explore the best surf spots depending on the conditions, having a car is essential. There are many car rental companies at the airports and in the cities. Forecast: Try to avoid coming when we have strong winds from the south or Levante; the coast becomes wild with winds up to 50 knots. When: In winter there are more waves but it can be cold and rainy. In spring it is warmer and everything is quiet, though it becomes difficult to catch the swell. Summer is pleasant and lively. The villages are festive and there is life everywhere. Waves are rare though. The beginning of autumn is perhaps best of all – it’s still warm, the beaches are not as crowded, there are generally no storms and swell begins to arrive. Neoprene: 4/3 in winter and shorty or swimsuit in summer. Location: You can find SUP, windsurfing and kite schools everywhere, but most of them are around Tarifa. Make sure you can rent a board but take it with you to other beaches before you come – email the hire companies in advance. Food: There are so many amazing local dishes but the very best of all is our tuna fish so when it is the tuna season, make sure you try it!